Celebrate summer and your country with this duo of American-inspired beach balls. 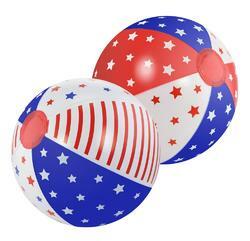 The patriot set features stars and stripes in a fun pattern that will make your next pool party a hit. Weight 0.25 pounds. 10. Plastic. UPC Number: 841437111125.